“Many quacks – and by quacks I mean the types who deny the heaps of medical evidence and the W.H.O. classification – run clinics where M.E. sufferers are denied their essential supports and told that they can do without them if they want it enough. Women and children with M.E. are mentally and physically abused by the health system. Sophia Mirza was forcibly sectioned having refused to attend a clinic where GET and CBT were mandatory for patients. She died two years later. The element that links these incidents is denial. It is difficult to understand how a doctor can say with a straight face that patients think themselves ill. Yet a small group of psychiatrists are defining British government policy towards M.E. with this very argument, and while some are growing wealthy applying harmful “cures” to these supposedly recalcitrant women, there is no funding for biomedical research into the illness. Bloggers have been doing their bit to spread the world for International ME/CFS and Fibromyalgia Awareness. 1. Chronic Fatigue Syndrome (CFS) is a serious disease with a ridiculous name. 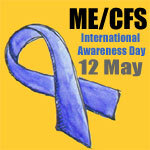 CFS is also known as Chronic Fatigue Immune Dysfunction Syndrome (CFIDS) and Myalgic Encephalomyelitis (M.E). It is often abbreviated ME/CFS. 2. ME/CFS is a complex, multi-systemic illness, effecting the immune, endocrine, cardiovascular, autonomic, and central nervous systems. It is classified by the World Health Organization (WHO) as a neurological disease. “Until my diagnosis and obsessive research as a result, I had no idea that there was an awareness day for CFS/ME. This is quite a shame. How are we to be better understood, receive more research funds, and find common workable treatment options with so much silence? Bloggers have been sharing their personal experience and writing about how ME/CFS effects lives as part of Awareness Day. “I’m now in my 6th year of trying to fight M.E., that is, the 6th year from diagnosis. The first ‘real’ symptoms began in 2002, but it may have in fact taken hold even earlier than that. I remain determined to carry on fighting and hopefully not let it break me. Admittedly some days are very frustrating, but I refuse to let my spirit be quashed. The last few weeks have been very difficult – especially after a period of relative stability – and I again find myself with the frustration that is all too familiar. Of course, I am not alone. There are many others who fight on, trying to make the best they can of a very bad situation. I have a great admiration for all of them, many of whom have it far worse than I do. We are all blogging for Awareness Day. Constant chronic fatigue. It’s difficult to explain how this type of tiredness feels, the nearest I can get is how you feel when you have flu, with no energy. Rest or sleep often makes little difference. At my worst, I hardly left the house, but have thankfully never been bed-bound, and happily I can now even manage days out. Memory and concentration problems. Including not being able to read or not being able to remember/find words. Lack of body temperature control. I’ve also suffered from depression alongside chronic fatigue. “* My overall health is currently about 60% of normal, but my symptoms fluctuate from day to day and sometimes within a day, so I can never make plans and expect to keep to them. * On average I have to spend twelve hours of every twenty-four in bed – but not always the same twelve hours! * On a good day I have the energy to walk for about two miles in the quiet countryside OR spend about an hour gardening OR dust and vacuum one room OR do about an hour’s shopping in the morning AND to do half an hour’s ironing in the evening – unless R’s out, in which case I have to do my own cooking INSTEAD. * On a bad day I’d struggle just to walk a few yards across the road OR spend five minutes deadheading OR hang up a load of washing. * On a really bad day it’s difficult for me to chew or swallow food – it’s been known for me to take an hour to get through one piece of toast. Whether you are wanting to raise awareness of ME, CFS or Fibromylagia there are some simple things you can do to make a difference.